Finding the right pair of jeans can be tough. There are so many different cuts and different body types that it can take a long search to find a pair that is not too tight, not too loose, and not hideous when you try them on. 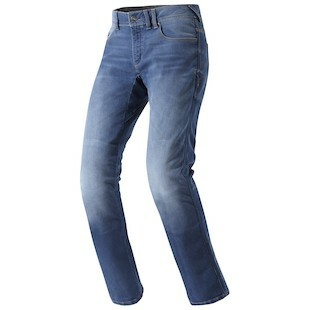 REV'IT is adding the Philly, Jersey, and Memphis H20 jeans to their lineup to add to possible trouser choices. Philly and Jersey are like yin and yang. They may seem like contrary forces, but they are actually complementary. Philly hoagies would not be as tasty without those Jersey tomatoes after all. The REV'IT! 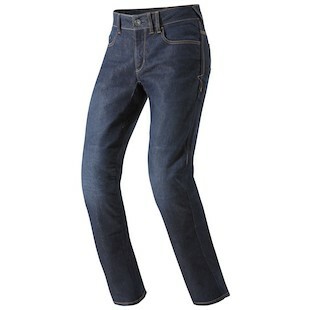 Philly Jeans are a relaxed cut with a Dark Blue wash. Infused with Coolmax material, these jeans help to regulate body temperature and the PWR shield material reinforces the front of the pant and seat. This unique combination of Cordura denim and PWR shield increase the slide time to 5.9 seconds at 60 mph, longer than leather. The vertically challenged can hem the jeans and a 3M Scotchlite stripe on the inside of the leg adds a nice touch of reflectivity at night when you roll up the cuff. Add in CE rated Knox Lite knee armor to round out the protection. Hip armor pockets allow you to add in the optional Tryonic Seesoft hip protector. Much like the Philly jeans, the REV'IT! Jersey Jeans also provide the same relaxed fit, yet with the lighter wash. Constructed from the same Cordura denim, which offers a slight stretch to help with fit and comfort, these jeans offer a different style to compliment the differences in geographic flavor. Regardless of where you fall in the debate between Philly or Jersey dominance, riders who want to look casual and feel comfortable will enjoy a higher level of protection when compared to standard jeans thanks to the unique denim and armor combination between the two. REV'IT! Memphis H2O Jeans are a relaxed-cut jean with a waterproof membrane. Yeah, you read that correctly. Rev'it added a Hydratex breathable waterproof membrane to their high quality denim to create a jean that doesn't mind getting caught in a downpour. Mesh liner keeps the oil on your skin from fouling up the waterproof membrane. Outer pockets will take on water, but REV'IT provided a single pocket with a water-resistant zipper to protect your phone or your wallet. Zippers are a weak point with any waterproof garment, and REV'IT uses a water-resistant fly zipper backed by a waterproof gusset. 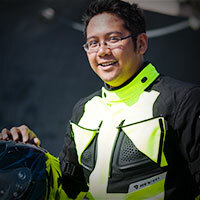 The PWR|Shield and Knox Lite CE-rated knee armor help to keep your skin and bones intact. These jeans will do more than just save you from precipitation. If you're a daily rider, the Memphis H2O jeans will keep you riding and looking casual. That's tough to do when there's an 80 percent chance of rain. REV'IT's new jean lineup will keep you protected on the bike and keep you looking good off the bike. These new jeans round out REV'IT's jeans line with a much more relaxed-fit options than their current lineup.